Remember when you were a teenager and you were trying to find yourself? Who are you & what do want to be? After you have a baby it’s like you are the hormonal, emotional and unsure teenager all over again. Eager to know the right thing to do and figure out who you are. Becoming a mother changes you in a way no one can really explain. I’m finding myself again. My child is 18 months old and I’m still figuring it all out. One thing I’ve learned is you need to take time for yourself. Check out my three tips for finding the new you. Because being a mother is now a part of who you are. 1. Get a hobby. A good blogger mommy friend of mine reminded me of this. It sparked a thought, a hobby? Oh yes, I like to paint. In reality I liked to paint. I haven’t painted since I was pregnant with Isabella. I want to paint again, I want to be a painter. I miss that hobby, it’s relaxing and fun and it’s something I want to be apart of me still. So I’m making an effort now to bring back the hobby I loved so very much. 2. Reflect. The best time for me to reflect is when I’m going for a walk or working out. I can think about me, my life and if there is anything I want to work on as a person. If you like to reflect in the tub with with class of wine, I’m right there with ya. Well, not with you, but you know what I mean. Find time to think about how your day or week has been. Are there things you wish you did or didn’t do? What can you do to make a change in yourself or your life? 3. Go Shopping. Even if you can only go shopping online. Heck sometimes that is better! I love to grab my laptop and glass of wine while I window shop or snag a cute lil something for ME. By doing this you are thinking about yourself, which is so important. You want to embrace being a mommy but you don’t want to lose yourself in the process. As a mom you are constantly busy and don’t have much mental time left for you and what YOU want. I noticed looking good and feeling good go hand in hand. When I shower and dress up I feel better. If you are looking for style and comfort I’ve got you. How adorable is this PinkBlush dress? I added a denim vest to it for a causal look. I dressed up my PinkBlush swing dress with some animal print shoes! Shopping online is easy and one of my favorite places to shop is PinkBlush. 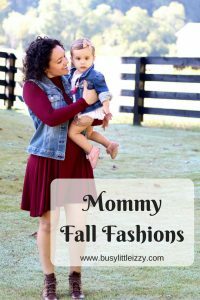 You can find adorable fashions for during, before or after pregnancy. If you are a mommy or mommy to be you will love it! The maternity dresses are so adorable. Almost all fashions stretch or flow to fit with a growing belly or hide your postpartum belly. Or in my case, hide the mommy belly I’m working so hard to put some abs on. I love this dress! Why? Well, it’s perfect for a pregnant mommy because of the stretch, a nursing mommy because of the criss cross neckline or a mommy chasing a toddler because of the comfort. From mommy life to dinner date with daddy, this Pink Blush dress is for sure going to turn heads! Go check out this online trendy boutique, reflect, and get a hobby so you can start finding the new you! I love PinkBlush dresses! And it’s so true! We have to find ourselves all over again. I want to start taking the time to read again. Yes, take time to be you. Being a mom is only a part. Read away mama! Both those looks are absolutely amazing on you!!! Absolutely love the dresses! And yes, these are great tips. Online shopping does any girl some good! Ha! For sure! Who doesn’t love shopping? Love the dresses. You look amazing. Your doing a great job mama. The pics are stunning! And You look incredible! Great post! Awe thank you so much Alexie! That means so much! Love this! My son is also 18 months old and I am trying to find myself again still. Being a mama is difficult but it helps when I have some me time. 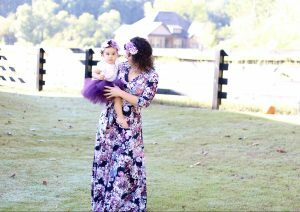 Loved this post mama, and you look gorgeous in those dresses! PinkBlush has the best dresses! I love how you added a denim vest to the swing dress. So cute! I love this! I was just thinking about this the other day! 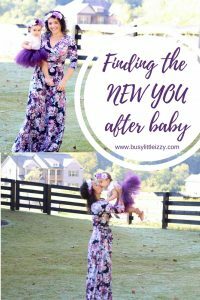 I have a 1 and 2 year old and am definitely in the process of refinding myself! I love these outfits you chose! You look beautiful mama! This is probably my favorite post yet! I love these tips so much! You are such a talented painter, so I can’t wait to see where that hobby goes! And I LOVE that dress. It’s like it was made for you!!! you look amazing mama!! So pretty! Awe you are so sweet! Thank you ? It does take a long time doesn’t it?! After my first I felt pretty much like myself again after about a year. It took about 2 years after my second was born. Love your tips! So necessary to do something you love, and sometimes a little retail therapy just perks you right up! The dresses are just gorgeous!! I just adore both of these dresses on you! you can never go wrong with Pink Blush! Thank you Lindsay I love that company! Yes! So important to find time for yourself after becoming a mama! I always feel better when I get ready, so I try to do that every day (minus 1-2 “bum” days!). Love the dresses!! Shopping is my cure to so much lol ? it’s so weird to think about finding yourself right? Oh that’s awesome! Congrats on the new blog!? ?